We are so thrilled with The Huffington Post's profile of Gumball Poodle founder Erica Easley - if you haven't already read the article check it out here! When we were contacted about the profile, the editors requested we send dozens and dozens of images for the corresponding photo gallery. Naturally, not all of them could be used with the piece but there are so many good ones that we want you to see...So, we're sharing a few more here. Enjoy! 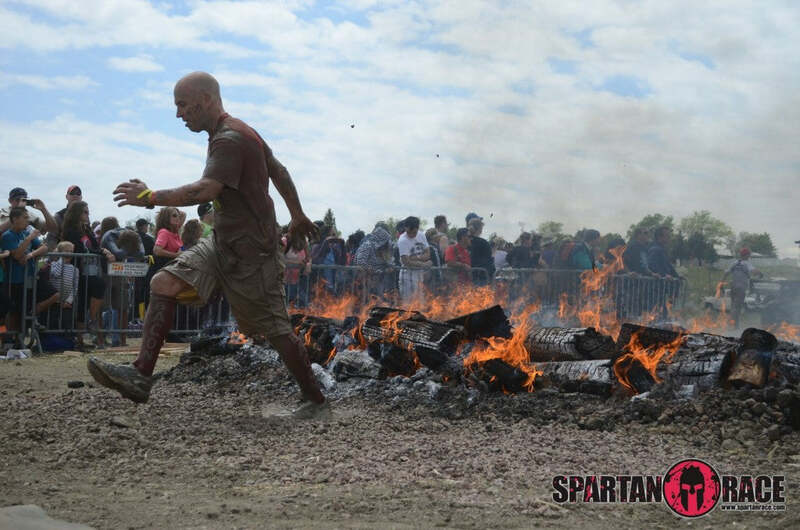 Fan Ken competing in a Spartan Race in Colorado...those are some dirty BACON socks! Since Day One, there is nothing more exciting for us than hearing from people doing fun things in our socks! Gumball Poodle is sold worldwide, and we've received pictures from all over - Croatia, Canada, you name it. Socks are simple things, and our goal isn't that complicated: socks that make you smile. From bookworms to badasses, knowing our socks are part of your wardrobe is so inspiring! 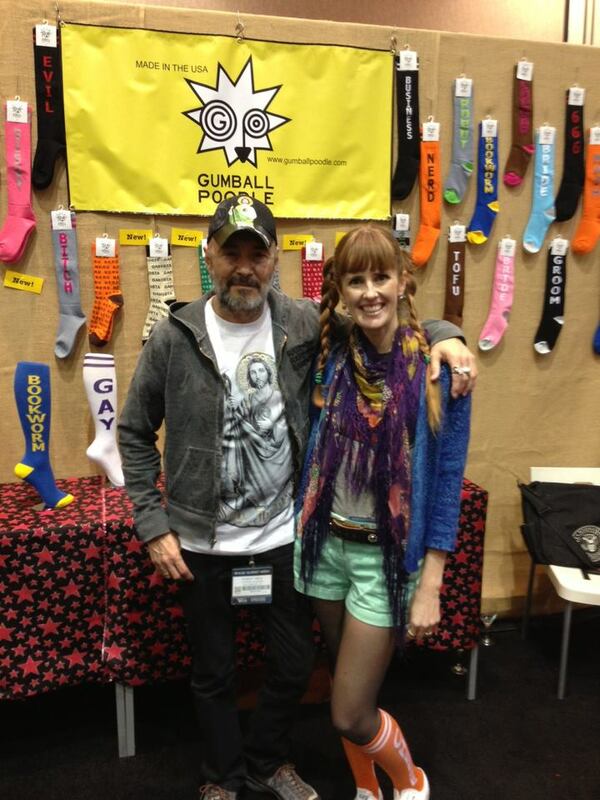 Gumball Poodle boss lady Erica Easley with pal Arturo Vega, Creative Director of The Ramones. Music has always been a big part of the Gumball Poodle personality and aesthetic, and if you are a rabid Ramones fan (like us) you might recognize a bit of Riff Randall in the Gumball Poodle "look". Arturo Vega created one of the most iconic logos of the 20th (and 21st!) century with the Ramones' seal. For fans of punk and The Ramones, Arturo's vision and history with the iconic band were fascinating...He really "got" simple, Americana design (interesting, given that he was a native of Mexico). Directly or indirectly, his work influenced Gumball Poodle. Erica knew Arturo since the early aughts, but this photo was taken at POOL trade show in 2013. The one and only Sam Phillips making Gumball Poodle glam in 2012! Since day one, friends have been an essential element of Gumball Poodle's success...We're so grateful for all of the help, guidance and encouragement we've received from this talented extended family over the years! Erica's friend, Sam Phillips, is the original Gumball Poodle Girl...lending us her legs when we've needed a model (no small favor, given that she's a former Jordache Girl) and photo shoot know-how on more than a few shoots. Sam has also kept us company at trade shows. Trust us: they are a lot more fun when she is around! The less glamorous side of the sock business: being your own roadie at trade shows. We firmly believe that to run a company, you need to be willing to do every job the business requires, yourself. Currently, that includes being our own manual labor force at trade shows...which is more involved than you might think. 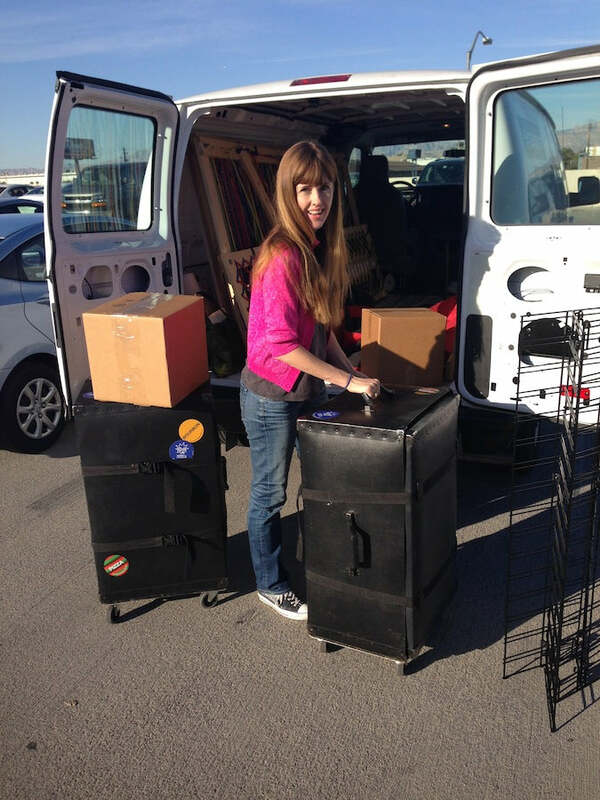 Packing crates, hauling heavy boxes, assembling displays - we do it all. We think it might be a little more fun if we had our own custom-painted Gumball Poodle cargo truck.